Welcome to the ODBD Blog! 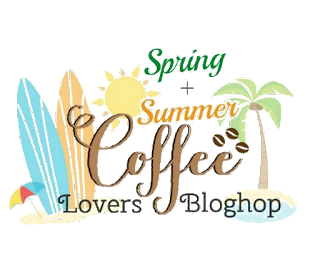 We are one of the sponsors for the Spring/Summer Coffee Lovers Blog Hop and are excited to have you stop by! We have donated a $25 ODBD Gift Code to one lucky participant! Our Daily Bread Designs offers many coffee/tea stamp sets that can be used alone or along with our very versatile Beverage Cup die set or Cups & Mugs and Mini Cups & Mugs die sets. We also have coffee themed 6" x 6" paper pad collection called Latte Love. This paper pad features 24 designer papers, 3 sheets of each design and 12 solid color papers, 3 sheets of each color. Click here to see the ODBD Coffee/Tea stamp sets, click here to see the NCC Coffee stamp sets. The Artistic Outpost Grunge Elements stamp set has a cool coffee ring stamp that can also be used with our Coffee/Tea related stamps and dies! Our Daily Bread Designs also carries 3D dies that can be used to create cute gift boxes/bags and fun folded cards! Be sure to also check out the Beverage Cup product page to see the many different ways that you can use this die set. 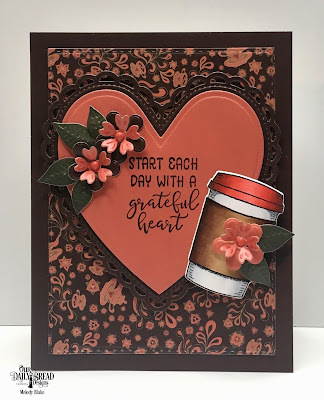 Melody Blake created the lovely card below using our Hug In A Mug Stamp/Die Duos set, along with the Latte Love paper collection and a number of ODBD Custom Dies. Links to the products Melody used can be found under her card. You can click here to shop our website or you can also place your order by calling our Toll Free Number at 1-877-451-4909. For more inspiration using our products, please visit our Samples Gallery, "like us" on Facebook and follow us on Pinterest and Instagram! Be sure to stop by the Coffee Loving Cardmakers Blog to see how you can play along and enter to win some fabulous prizes! Beautiful card, love the design! Thanks for sharing. Such a PRETTY card, love your color choices and all the wonderful details! such a beautiful card! quite regal. Really pretty card. Love the colour combo. Thanks for sponsoring the hop! Pretty with beautiful coloring! Thanks for being a super sponsor! I love the colors on your card! Beautifully done! I absolutely LOVE Our Daily Bread, all the fabulous inspiration, and really appreciate you sponsoring this coffee hop. LOVE LOVE LOVE! This is the perfect sentiment for a morning with good coffee! Great idea! Thanks for being a part of this hop! Beautiful card and thanks for being a super sponsor. Beautiful card. Thanks for being a super sponsor. Gorgeous card! LOVE the colors and the design. Such a beautiful card! Love that heart!! Awesome products and thank you so much for being a Super Sponsor again! Gorgeous card! Thanks for being a super sponsor. A wonderfull card, like the colours that Melody used. Thank you for being a sponsor toooo on the 2018 Coffee lovers blog hop. What a gorgeous coffee card! I love the colors and the paper that you used! That sentiment is beautiful too! Thanks for being a Super Sponsor for the Spring and Summer Coffee Lovers Bloghop!! Very pretty card. I love the sentiment and colors. The coffee cup looks awesome. Thank you for sponsoring the blog hop. Awesome sentiment,beautiful card! Thanks for being a super sponsor! Beautiful card and fab sentiment! Thanks for being a sponsor to this fun hop! Wow! Awesome layout, colors and details!!! What a beautiful coffee card. Love everything on it. Gorgeous Card! It is so nice to see beautifully handmade Christian cards here too! I absolutely love all the colors and patterns and layers that are going on with this card! I am going to have to check out all your goodies to see what I need to save my money for to buy! UhOh!! Also thank you so much for being an AMAZING sponsor too! very cute!! Love the colors you used! Lovely card. I like the heart and the flowers.